How Strong is the EU? The Euro will decline, especially during the month of January,June, July and October, and we will hear of one or more European countries thatwill want to abandon the EU Agreement. [This does not mean that they will]. We have continued to hear about other countries such as Germany and France which have strong political parties that have expressed their desire to leave the EU. These concerns continue to be strong, as countries such as France feels they have little control of their borders. This is an interesting interview Mme. Marinne Le Pen, presidential candidate for France. One thing I have repeatedly expressed is that Mundane Predictions do not necessarily act out its prediction immediately, but rather commences its action and make take a few years to enforce. It’s one of the most anticipated weddings of year, the Royal Wedding of Prince William of England to journalist Kate Middleton. Traditional astrology can evaluate from different astrological perspective, the fate of this young couple, and how their marriage will turnout. In the past, the royalty would have an astrologer who selected the best time to perform the wedding, not to mention that in India, it is customary to evaluate the chart of both natives in order to see if they are compatible or not. In the case of Prince William and Kate Middleton, the prince's chart shows that they have little in common, but look good as a couple. The prince tends to attract more of a conversationalist and a woman with a lot of initiative, but his ideal woman is a reserved and quiet, much like his mother. She on the other hand is more sure of herself and reflects more confidence than him, while he will turn out to be her worst enemy, pretending to being what he is not. This configuration is the same as the golfer Tiger Woods, in other words, it is likely that she will not be obedient, and will defy him and will want to impose her position. The Lot of Marriage is Aquarius, and although his Ruler Saturn, is in its exaltation, it shows us that there will be differences of opinions on bringing up their children, or his outings with other women, some may be friends of her or known to her. These problems will become accentuated because he will have little patience with her. By 2013, they will be announcing the arrival of the baby or having their first baby during that year, that is, for late 32 or early 33, but this does not help to improve their relationship, on the contrary, and for 2014 the difficulties will continue intensifying for them. We will hear by the end of 2016 or early 2017, Kate Middleton is moving out of the residence. On April 29, the Moon is peregrine, in Pisces and waxing which reflects that there will be no strength in the beginning of their marriage and their love will wither away. Fears will be awakened by Kate Middleton, as her private affairs will reach the public. The Ascendant in Leo, the outputs of Prince Williams will be visible and this is what causes the problems of the couple. The couple's personal problems will begin to be reflected during the years of 2014, when we will hear rumors of their separation. Initially, he will not be willing to part with her, during the period of controversy, but this should come about sometime in 2018, when surely we will hear about their divorce. Most likely their divorce will come about sometime around his 36th. or the start of his 37th. years of age. Syria is under strong protest and the initial economical spending cuts in England is just the beginning of what will continue to spread throughout Europe. As people continue to feel the lack of social equality, more benefits towards large corporations, and social injustice, we will continue to see an uprising of people. 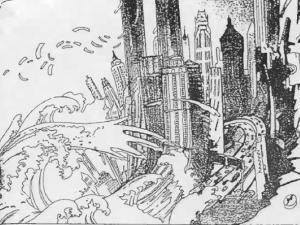 In 1989 Michael Lewis wrote an article called; “How a Tokyo Earthquake could Devestate WallStreet”. Well, we all know the story and it’s effect or the effect this will have in the economy. Just when the government mentioned that the economy was starting to get back on its feet, we get the Arab uprising with oil prices going up and out of control, and now the earthquake/tsunami, that has devastated Japan. If this was not enough, their nuclear problems. For the last few years I have been predicting that the US economy could only get worse, and I, now more than ever, believe we are headed toward a most difficult situation. EU: We will continue to hear about job loss. You may hear of layoffs in airlines, in the mail or anything related to transport or communications. The next six months there will be various affected sectors such as agriculture, communications, transportation, areas of health, banking and investments, we will lose or the government will stop recruiting employees in the government. We are likely to see growth amounting to 10.5% from 12% of unemployed people in the country before the year ends. Wages in many of the companies will be frozen, or we will see pay cuts, and/or decrease in property of persons. We will hear of the uncover of a major fraud or financial scandals. When looking at a Mundane chart, it is most difficult to see or understand, from an emotional view point, that at this stage of our lives we will be witnessing and probably form part of such historical events. It just goes beyond on our sense of comprehension. We can only embrace ourselves to live each day as if it were the last of our days, enjoy our lives next to our love ones, and remind our children to embrace the only thing we have sure in life, our love for each other. The last few weeks have been intensive, as we look at the events that have been shaking the world. When we look at applying Mundane events through astrology, the ancients left a series of rules, when followed, would help delineate the events that would unfold. In my predictions of 2011, I titled these predictions as; “A World in Crisis”. The title does not fall short of the events that have been occurring, but most surprisingly is the fact that we will commence to understand that the situation in the US will only become worst. Power struggles come from areas such as India, Syria, and there will be major conflicts in areas such as Arabia, Germany, Russia, England and France. I did not take a look at these countries per se, to determine what kind of problems, nor when these would occur. (I have a full time consultation practice). But it is undeniable, that the events are there, and we should expect to continue to see more events of this kind occurring throughout Europe and Latin America. We will hear of protests, and as some countries will go against their leaders. The people will feel that scarcity increases, and will suffer because of damage crops, while all this happens, very little will the leaders care for their countries. The eastern area of America is likely to suffer an earthquake. I have been consistent in mentioning that the economy will worsen, this despite the fact that we have heard that the economy is getting stronger, that unemployment has not gotten worse, and that companies have agreed to employ more people. • Congress discriminatory budget cuts. • In-Pass between Congress and the President. • The rise of oil. One can begin to understand why the course of these predictions will take place. This, without mentioning, the possibility of another war taking place in the upcoming month in Korea. We will continue to see protest, but not only in the Arab countries, but elsewhere, like in the US, Latin America and Europe. 2011 will be remembered as one of upheaval, but few will gain the objectives desired. It is interesting to see how destiny unfolds itself and how the alignment of the stars anticipates mundane events. Although I am far from being an expert in the material, understanding that I have not grasped the full knowledge that the ancients have left us, and that there are techniques, yet unknown to me, plus the Grace of God that allow men to foretell the future with the necessary wisdom and humbleness to communicate as prophets, I dare delve myself in these matters, with the only intention to the greatness of His writings. Puerto Rico: The people feel a loss of honor, as the employment situation continues to deteriorate, they will feel that the hopes will dissipate. All this will come by the continued loss of employment. Puerto Rico: Unemployment will continue to be rampant, reaching unseen proportions. It is likely that the island suffers from an unemployment rate of 18% or more before the year ends. The government will be at lost and will not find alternatives to the ailing problems and will feel at lost and idly without knowing how to cope. The government reported a 17% unemployed, the highest ever, and it continues to worsen. During the first month of January an all time hign, 111 assassinations, 37 more than last year. US-And cold winds come during the first months. Hear heavy snow storms, especially during those first months of the year. During this month a snow storm has hit the US, from Dallas, Texas to Boston, Mass. Egypt and Tunisia part of the Arab world, are foreseeing an upraise of protest against the government. We will continue to see this during the upcoming month. As far as Egypt, I am afraid de Mubarak will not hold on to power much longer, and the events will continue to escalate. When the Moon reaches the terms of Mars in a fiery sign, which will be within the 17 and 19 of February, it is most likely that he will no longer be in power during these dates. The forecast of world events, from an astrological point of view has always been regarded as a branch of astrology which is of most interest to the public. However, their prognosis, is still very difficult. This was completed in November, and made public through newspapers in December. Already many of my predictions have started to unfold. The Ruler of the Year is Saturn and is in the ascendant, Retrograde and the Moon separates from Saturn. The Ascendant represents the people, and the moon is the main signifier of the masses of the people and this means that many sorrows will befall people and misfortunes. The men of wealth will be unfair to the common people, and this will be mostly reflected in the work area. Therefore, increase of layoffs, and we will see protests against the companies. Mexico: The Ruler of the Year for Mexico will be Mars, and this is indicative that many disputes will arise among men, and there will be an increase in the death of women or domestic violence. Men betray their partners, and disputes will arise against each other. All this brings massacres, murder, blood-related diseases, deadly pains, many fights and conflicts. Rebels will rise against the president or his government, and leaders feel anger against his people. Pests are present in some regions. Corruption abounds, and the people will seek to dethrone the noble men of their "status". US: Men will be seeking to move to other places, from one state to another, looking for better welfare. The elderly continue to suffer greatly from the economic havoc, as well as those frail physiques. Men will be involved more in sports, as a form of entertainment, and to improve their income and seek creative ways to achieve it. We will see an increase in marriage. No respect for law and those who make the law. We will see an increase in poverty in many parts of the U.S., but this will be seen more in the north and northwest and southwest of the U.S. We will see an increase in taxes, especially in those areas of the country. The country will be in pursuit of knowledge, so listen to great advances in science, in medicine with respect to Alzheimer's, Parkinson's, or operations in the brain. There will be a desire to write and we will hear of people who want to give wise advice. People will seek to distract the problems at concerts, dances, and fun. Therefore, these areas will be favored as a business opportunity. We are likely to see riots in the eastern area of the U.S., or that this area suffered heavy losses and devastation. You may hear of the death of a respected judge. We see the destruction of churches, or individuals opposed to religion. Mexico: The economic situation continues to deteriorate. The people will feel that the president's actions will be in there detriment and will bring them much loss of livelihood. Young people are the ones who will suffer most from the economic situation, resorting to other measures to meet their needs. There will be a lot of uncertainty, estrangement from family and death among them. The intelligent man will be delivered to their work and take care of their health. All in search of better economic issues, and spend less on the disease. The president will want to increase taxes to the Mexican people. There will be an increase in the death of children, and many die from the lack or poor nutrition. Puerto Rico: The people feel a loss of honor, as the employment situation continues to deteriorate, they will feel that the hopes will dissipate. All this will come by the continued loss of employment. The less fortunate and the elderly suffer huge economic damage, hunger, and lack of care. They will see an increase in taxes or in other areas to seek to alleviate the economic burden of government. The man will be given to vices, gambling, looking to improve their income, there will be an increase in marriages between young girls and who wish to become pregnant. But adults will not want to marry and we will see a decline in marriages among adults. There will be discord among men, they will be disobedient to the law and increase poverty among the population, as there will be shortages, damages, and deception by individuals. The man moves to the North and the Northeastern U.S., looking for better welfare. But the puertorriquens will be aware that there will be little opportunities and there luck will seem to drift away from the people. They will feel that their closest allied will go against them and they will be left in disrepair. He will be overtaken by great sadness and sorrow to see the crumbling of family welfare. There will be an increase in divorces, and many disagreements arise between husband and wife. EU: For health, we will hear the main topics will be, kidney problems, lower back, the lumbar or sacrum. It will be a year that people will feel lost emotionally and resort to drugs to keep the trial. Household affairs or the concerns of "foreclosure" re-emerge, and this causes much sorrow in the population and are affected by depression. Winter will bring a bad cold, fever, and prolonged illnesses. But this emphasis is more on the Libra, Aries, and Cancers. Mexico: The Mexicans will suffer pancreas problems and increased diabetes, liver and suffer from foot conditions. But all this will be more emphasized in those who are Piscean or those who are virgos. Fever abound among Mexicans, and we will hear of the death of good men. Puerto Rico: An increase in diabetes will be significant over the coming months. Puerto Ricans will feel the economic pressures on the back, or lower back. There will be a lot of depression and people who seek seclusion. It is likely that we will hear of the emergence of disease outbreak that causes fever and death among children, and this could be happening for the months July to September. The Department of Health and Hospitals will not be ready. In the first months of the year, hear about the death of a statesman, a politician or someone famous or recognized in the country. Mexico: The unemployment situation is not as severe, but what will be affecting more is the rising cost of living and the wages that are paid to the Mexican. In any case, you may see a growth in employment due to foreign companies wanting to locate there. There will be an increase in death from sickness. Puerto Rico: Unemployment will continue to be rampant, reaching unseen proportions. It is likely that the island suffers from an unemployment rate of 18% or more before the year ends. The government will be at lost and will not find alternatives to the ailing problems and will feel at lost and idly without knowing how to cope. The people will suffer from shortages and even those who are working, feel that money will not be sufficient to cover their daily expenses. For those who maintain their jobs, they will not receive an increase in salaries nor bonuse. The government will be exposed and the deception and theft that have been perpetuated by the government or government sectors, such as the University, the costs of judges, and education all will be criticized by the people. U. S. - The first six months will shortages in agriculture, we will hear of loss, and this will cause an increase in food prices. We are likely to see losses in areas like the Southeast and Northwest United States. The damage will ensue to crops by flooding problems. Mexico: - The area’s most affected are the Northeast and Southwest of Mexico. Puerto Rico: - suffer from severe floods and crop losses during the first six months, especially during the months of June and August 2011. The cost of food will be high, and there will be shortages on supermarket shelves. We will see an increase in crime in areas such as North and Northeast U.S., will increase the percentage of scaling and auto theft or means of transportation also will increase. Mexico: death befalls many young people will be involved in unlawful things, the increase in theft and shady deals are the order of the day especially in areas west and south of Mexico region. They may not have control over its borders and continue hearing about the death of soldiers or policemen. The areas of northeastern Mexico will be most affected by the crime wave. Puerto Rico: The increase in crime will continue to be rampant, increase escalations, and the death of young men, we will continue to hear of the death of policemen. There will be a tendency for women to hate men, and look for children, and continue listening to the news of child abuse and shameful abuses will continue shaking the country. The east area will have many arrests, the crime wave that scourge. Continue the wave of abuse of women and men will be relentless in their pursuit of crime. And cold winds come during the first months. Hear heavy snow storms, especially during those first months of the year. You may hear of an earthquake in these areas and in areas north of Mexico, eastern United States, and the area east of Puerto Rico. The first three months of the year, rumors about the possibility of war, there will be tensions worldwide and is likely for March or April, June or September, the same is being given due to lack of diplomatic agreements. There will be no penalty, and many innocent people die in the process. All this will cause worldwide turmoil and will be the beginning of what will happen in the future. Hear of rebellions, malaise and two leaders who incited the war. It is likely that a country moves from the hands of one leader to another, the humiliation of a leader and his drop in rank. Hear of the misfortunes of some deputies. There will come a war that will cause hunger among the people, fears, and epidemics that are destructive to the people. Jupiter is in opposition to Saturn in Aries Solar Income for 2011, which announces war, and being in Aries, since it is a fire sign and it is a day chart, the war comes from the east. Saturn is in Libra, retrograde and represents the north east, and is in poor condition. As shown left by ancient South Korea will be the one to initiate war, and North Korea is the country that is afflicted. "You must look to the Ruler of Midheaven to see if it is below its burning rays entering, that represent the king's death ... And if the signifier of the king was found with a planet VIII House, or House VII , from his opposition or square, is fear for the king's death during that year ... if the signifier of the King is entering combustion in that year, the king of that region will die in that year. " The fall of rank could be the son of Kim Jong Il and North Korean unification with South Korea. All this will happen at a great price. Although I see four possible dates in my predictions, (March, April, June or September), I lean more towards March, and days which are not favorable are from 18 to 29. We will hear about the uprising of the people, especially during the month of April in different parts of the world, but especially in Europe. It is likely that by the end of March or April we hear about the death of a political leader. April and May will be an asset with an increase in the death of soldiers, heavy rains, strong winds, and probably an earthquake. We will hear of protests, and as some countries will go against their leaders. The people will feel that scarcity increases, and will suffer because of damage crops, while all this happens, very little will the leaders care for their countries. The eastern area of America is likely to suffer an earthquake. But some countries will continue to be strengthened economically, while the people suffer from increases in taxes.